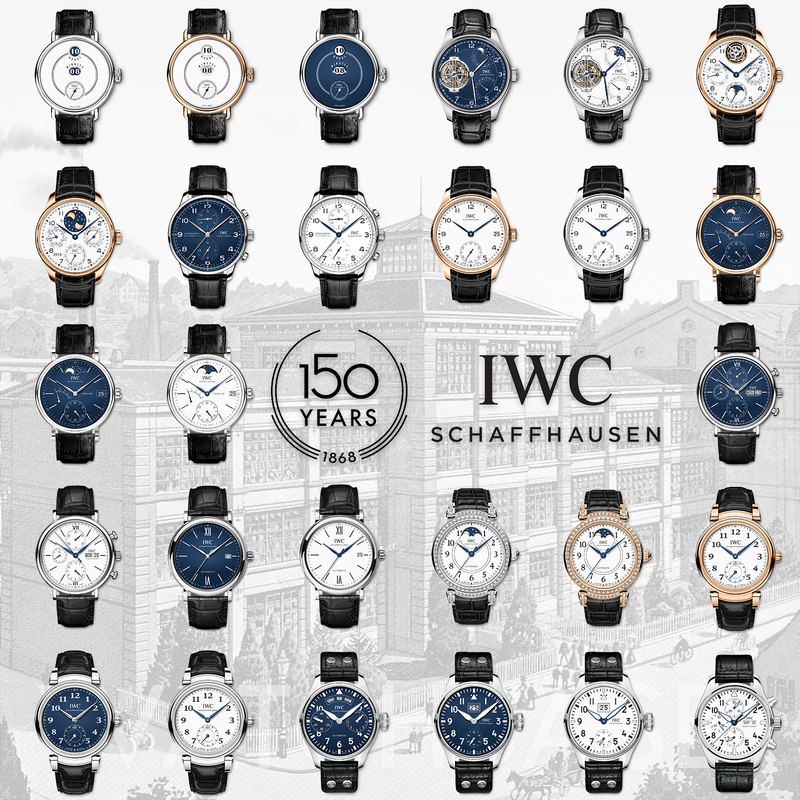 IWC celebrates its 150th anniversary this year. At SIHH 2018 the Schaffhausen-based brand launched a collection of 27 watches to mark the occasion. They’re now live on WatchBase, including prices in Euro. Links to their entries below! 25 pieces, platinum case, white lacquered dial. 250 pieces, red gold case, white lacquered dial. 250 pieces, stainless steel case, blue lacquered dial. 50 pieces, red gold case, white dial. 15 pieces, platinum case, blue lacquered dial. 15 pieces, platinum case, white lacquered dial. 50 pieces, red gold case, white lacquered dial. 2000 pieces, stainless steel case, blue lacquered dial. 2000 pieces, stainless steel case, white lacquered dial. 1000 pieces, stainless steel case, white lacquered dial. 150 pieces, red gold case, blue lacquered dial. 350 pieces, stainless steel case, blue lacquered dial. 350 pieces, stainless steel case, white lacquered dial. 50 pieces, white gold diamond-set case, white lacquered dial. 50 pieces, red gold diamond-set case, white lacquered dial. 500 pieces, stainless steel case, blue lacquered dial. 500 pieces, stainless steel case, white lacquered dial. 100 pieces, stainless steel case, blue lacquered dial. 100 pieces, stainless steel case, white lacquered dial. Total number of pieces: 17605.